A development team represents a significant investment on the part of the business. There are salaries to pay, offices to rent, computers and software to buy and maintain, and on and on. The product owner is responsible for maximizing the return the business gets on this investment (ROI). One way that the product owner maximizes ROI is by directing the team toward the most valuable work, and away from less valuable work. That is, the product owner controls the order, sometimes called priority, of items in the team’s backlog. In Scrum, no one but the product owner is authorized to ask the team to do work or change the order of backlog items. Another way that the product owner maximizes the value realized from the team's efforts is to make sure the team fully understands the requirements. Only then will they build the right thing, and not waste time building the wrong thing. The product owner is responsible for recording the requirements, often in the form of user stories (eg, “As a <role>, I want <a feature>, so that I can <accomplish something>”) and adding them to the product backlog. Each of these users stories, when completed, will incrementally increase the value of the product. For this reason, we often say that each time a user story is done, we have a new product increment. The scrum master acts as a coach, guiding the team to ever-higher levels of cohesiveness, self-organization, and performance. 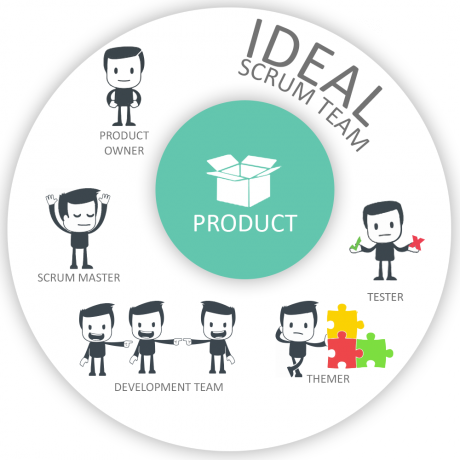 While a team’s deliverable is the product, a scrum master’s deliverable is a high-performing, self-organizing team. The scrum master is the team’s good shepherd, its champion, guardian, facilitator, and scrum expert. The scrum master helps the team learn and apply scrum and related agile practices to the team's best advantage. The scrum master is constantly available to the team to help them remove any impediments or road-blocks that are keeping them from doing their work. The scrum master is not—we repeat, not—the team’s boss. This is a peer position on the team, set apart by knowledge and responsibilities, not rank. High-performing scrum teams are highly collaborative; they are also self-organizing. The team members doing the work have total authority over how the work gets done. The team alone decides which tools and techniques to use, and which team members will work on which tasks. The theory is that the people who do the work are the highest authorities on how best to do it. Similarly, if the business needs schedule estimates, it is the team members who should create these estimates. A scrum team should possess all of the skills required to create a potentially shippable product. Most often, this means we will have a team of specialists, each with their own skills to contribute to the team's success. However, on a scrum team, each team member's role is not to simply contribute in their special area. The role of each and every team member is to help the team deliver potentially shippable product in each sprint. Often, the best way for a team member to do this is by contributing work in their area of specialty. Other times, however, the team will need them to work outside their area of specialty in order to best move backlog items (aka user stories) from "in progress" to "done." What we are describing is a mindset change from "doing my job" to "doing the job." It is also a change in focus from "what we are doing" (work) to what is getting done (results).